This delicate and refined antique Chinese display stand is crafted in hardwood and imitates the use of bamboo; both being traditional materials used in China. The display stand, simple and yet perfectly formed, features two hardwood platforms of different heights set into a frame that has been carved to resemble bamboo. Around the platforms, one of which is square and the other rectangular, run friezes of intricately carved scrolls, adding to the decorative quality of this delicate piece. 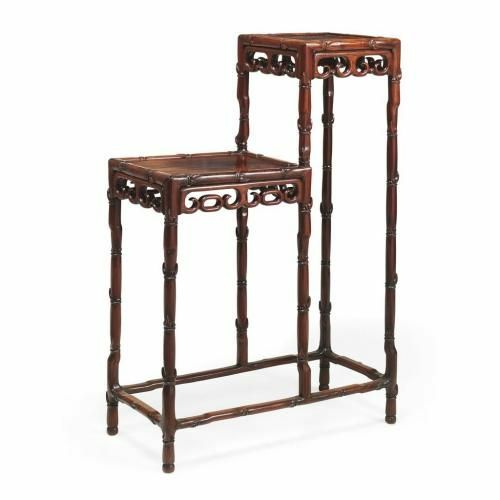 This stand would be perfect for the display of plants, vases, or other collectable curiosities, and is deeply rooted in ancient Chinese culture through the incorporation of bamboo into the design. The deep root of bamboo is said to represent resoluteness, the tall stem is said to represent honour, the hollow inside the bamboo is said to represent modesty, and the clean, simple appearance is said to represent chastity.